In the past few days we have heard endless explanations for the market’s big “Oops!” and the return of volatility. 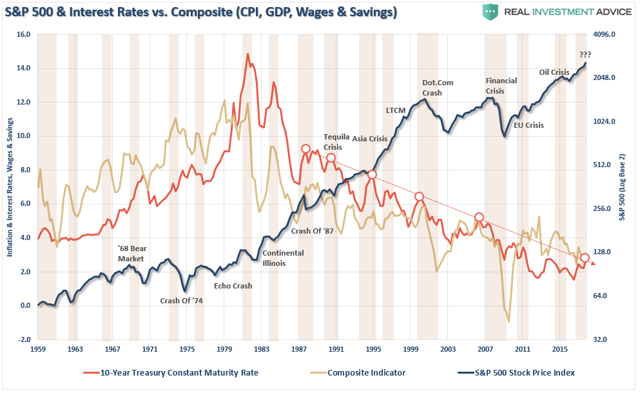 The commentary has centered on the Fed and its sister central banks as they begin to batten down the hatches on inflation and trim their balance sheets (prematurely, in my view). There is an interesting thing about ETNs. These are exchange-traded notes, and while I don’t want to get to arcane on you, a key feature of them is that there has to be a bank or a guarantor on the note. Even though we’ve had at least two shortfall ETNs literally blow up and go to zero, the investors in those funds are going to get “something.” If you put in your withdrawal request while there was still a price, there is an extraordinarily good case that you are due your money. And of course, the ETN fund doesn’t have any money. But the bank that guaranteed the ETN is on the hook. One of the ETNs was evidently backed by Credit Suisse. Credit Suisse made an announcement before the market opened yesterday morning that they had 100% of their liabilities hedged out in the marketplace. Of course, they didn’t say hedged out to whom, and that will make us all wonder about counterparty risk; but we won’t have answers on that for a long time, and while a significant amount of money is involved, it is not life-threatening to a bank the size of Credit Suisse. More like annoying than life-threatening. Just for grins and giggles, I submit this list of the largest shareholders in SVXY, one of the short-vol VIX funds. Interesting to see Harvard Management in there. Really? Harvard is reaching for yield? I was probably making two calls a day to my go-to guys in the high-yield market, to see how high-yield bonds were responding. I think ultimately the collapse in high-yield will precipitate “the Big One.” You just can’t understand how much in high-yield bonds has been sold, how poorly the covenants are managed, and how badly investors are going to get screwed. You watched this last week as the VIX fell out of bed. I am telling you that what is going to happen in the high-yield market is going to be more – much more – of the same. It’s going to seemingly fall out overnight. The bids are going to disappear, and high-yield bonds are going to be sold to what are essentially distressed-debt funds at distressed-debt prices. Further, as we get into late 2018 and then into 2019 (not to mention 2020), the amount of high-yield debt that has to be “rolled over” becomes significant. And it is obviously going to have to be rolled over at higher interest rates. There will be some companies that will be able to handle those rates, and there are some companies that are simply way out over the tips of their skis, trying to schussboom down a double black diamond slope, and the outcome is going to closely resemble one of those “agony of defeat” moments from the old Wide World of Sports TV show. We’re talking some spectacular face plants. You do not want to be involved, unless from the short side, when that happens. The Fed is inadvertently increasing the risk for these funds by raising rates. Now, frankly, I don’t think the Fed should be paying any attention to how much pain they are causing the high-yield bond market when they make decisions on interest rates. Theoretically, you should be a big boy to be playing in that market. Except that there are a lot of mutual and ETF funds that allow very small mom-and-pop operations to reach for yield just like Harvard Management. That was an annoying moment for Harvard, but it’s a rounding error. If guys like me weren’t calling them out on it, nobody would even notice. But I’m not even on their Christmas card list, so…. But let’s get back to Uncle Doug Kass. This week’s OTB is a composite of some of the recent letters he has done for Real Money. I thank him for giving me permission to republish. By the way, did anybody else notice that the high-frequency traders who are always bragging about how they provide liquidity to the markets simply disappeared as the markets fell through the floor? Where was this liquidity they were talking about? They have the inordinate privilege of front-running everybody’s money, taking basis points from every trade, on the theory that they are providing liquidity. And they simply withdrew it via their completely quantitatively computer-controlled system. High-frequency trading should be reined in, and any bid or ask prices submitted by computers should be made the last for at least 0.5 seconds. Slow enough for a young trader with good twitch speed to hit the button on their own computer and execute. That would of course mean that volumes on the NYSE drop significantly, but that’s volume we don’t need; it’s meaningless. It’s not there when you need it – witness this past week. By Douglas A. Kass, Seabreeze Partners Management Inc.
* Friday was likely the day the short volatility trade died. * A massive regulatory overhaul is needed to counter the destabilizing influence of strategies and exchange traded products that have overwhelmed our markets. The issue NOW is the pile-on going-forward across assets, as the systematic “short vol” community’s models are now completely toast, and they too will be forced to cover remaining “short vol” positions that didn’t trade today-i.e. BE PREPARED FOR A MAJOR VIX FOLLOW-THROUGH TOMORROW. 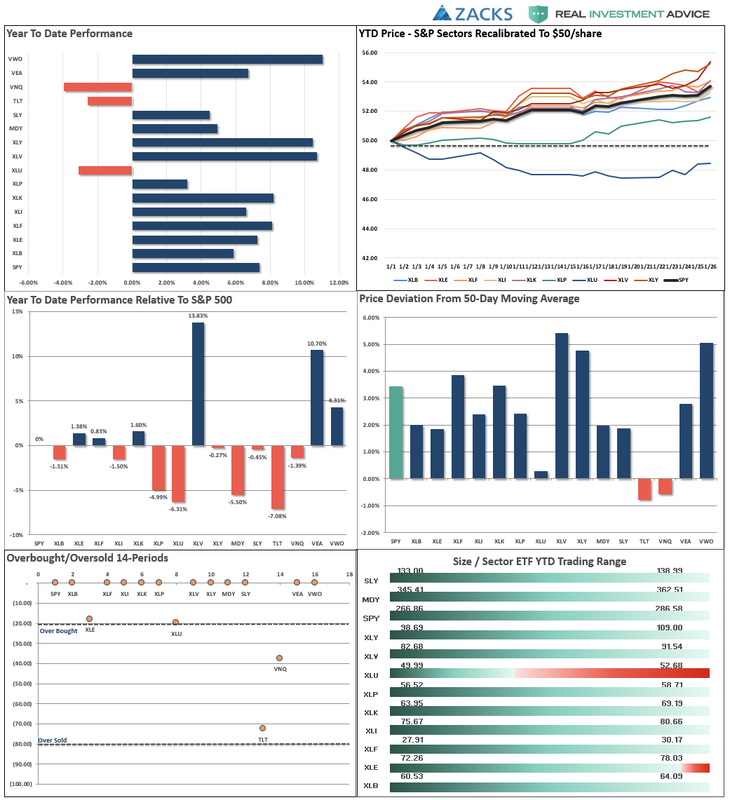 That shift in structure coupled with the popularity of passive strategies (ETFs) continued to have a pronounced impact on the markets, pushing volatility to (a hat size) of record lows and stocks to record highs – arguably, creating something of a “buyers’ panic” in January as late-coming retail investors (suffering from “FOMO”) poured a record $50 billion into the coffers of domestic equity funds. This buyers’ panic occurred in a backdrop of less liquidity and lower market volume – further exacerbating the late 2017/January gains. That buying forced RSIs towards unprecedented levels as investor sentiment surveys made multi-decade bullish highs. As stocks climbed ever higher, skepticism and doubt were nearly abandoned and assessment of risk vs. reward took a back seat to bullishness. 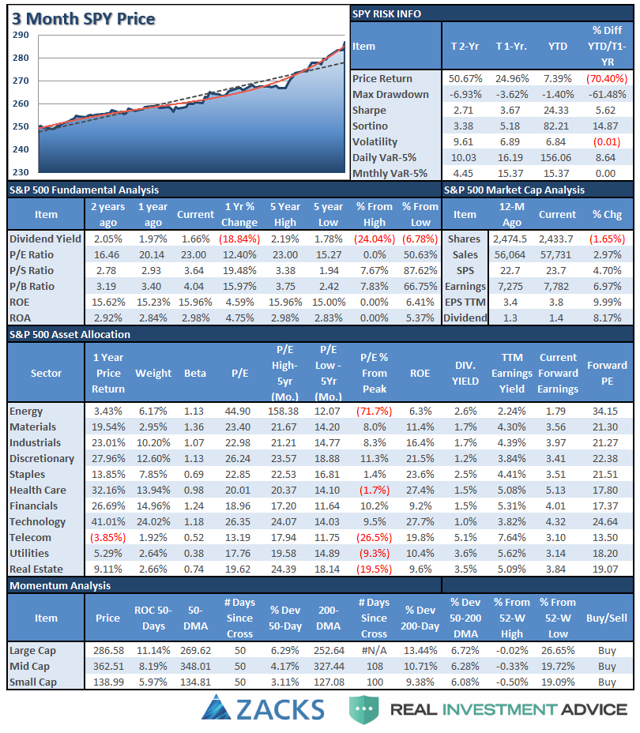 In last week’s note, we noted that volatility, at the time, was not sufficient to trigger systematic strategy de-risking. On Friday, the market dropped ~2% on a day when bonds were down ~40bps. The move on Friday was helped by market makers’ hedging of option positions (as gamma positions turned from long to short midday). Friday’s move, on its own, was significant as it pushed realized volatility higher, which is a signal for many volatility targeting strategies to de-risk. Anecdotally, broad knowledge about the risk of systematic selling kept many investors fearful and waiting on the sidelines (both in equity and volatility markets). Midday today, short-term momentum turned negative (1M S&P 500 price return), resulting in selling from trend-following strategies. Further outflows resulted from index option gamma hedging, covering of short volatility trades, and volatility targeting strategies. These technical flows, in the absence of fundamental buyers, resulted in a flash crash at ~3:10pm today. At one point, the Dow was down more than 6%, and later partially recovered. After-hours, the VIX reached 38 and futures more than doubled – it is not clear at this point how this will reflect on various short volatility products (e.g., some volatility ETPs traded down over 50% after hours). Today’s large increase of market volatility will clearly contribute to further outflows from systematic strategies in the days ahead (volatility targeting, risk parity, CTAs, short volatility). The total amount of these outflows may add to ~$100bn, as things stand. However, we want to point out the massive divergence between strong market fundamentals and equity price action over the past few days. The large market decline over the past few days will likely draw fundamental investors and even trigger pension fund rebalances (those that rebalance on weight thresholds). We also want to highlight a strong probability of policy makers stepping in to calm the market. Rapid sell-offs, such as the one today, can also be followed by market bouncebacks as liquidity gets exhausted by programmatic selling. With next year P/E on the S&P 500 now below 16, further positive impacts of tax reform and stabilization of bond yields (e.g., note the current record level of CFTC bond short positions), we think that the ongoing market sell-off ultimately presents a buying opportunity. MAY YOU live in boring times. Financial markets have become dull, if profitable. The S&P 500 index, America’s leading equity benchmark, has notched up its longest-ever streak without a 5% reversal. Bond yields may have inched up in recent months, but are still at the bottom of historical ranges. 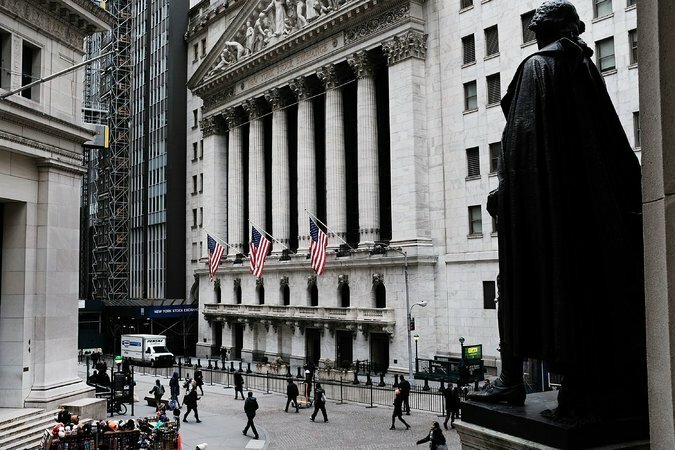 Institutions famed for their trading prowess, such as Goldman Sachs, have seen profits dented by the quiescence of the markets. This lack of market volatility owes much to the steadiness of monetary policy since the depths of the financial crisis. Central banks have kept short-term rates low and have intervened to push down bond yields through their programmes of quantitative easing (QE). The classic method of pricing financial assets is to say they are worth the discounted value of future cashflows; since central banks have kept the discount rate steady, prices have been steady too. The late Hyman Minsky, an economist, thought that long booms sowed the seeds of their own destruction. He argued that, when the economy was doing well, investors tended to take more risk (such as taking on more debt). These speculative positions are vulnerable to a shock, such as a sudden rise in interest rates, which can turn into a fully fledged crisis. In these days of sophisticated markets, speculators are not restricted to their own capital or even to borrowed money to buy assets to bet on the good times continuing. They can use derivative instruments to bet on prices. Indeed, there is actually a market in volatility. The steadiness of the S&P 500 shows that actual, or realised, volatility has been low. But investors can also hedge against a sharp move in the stockmarket (in either direction) by taking out an option, giving them the right to buy or sell equities at a given price within a set period. The price, or premium, they pay for this option reflects a lot of factors. But one of the most important is how choppy investors expect the market to be in future. This measure is the “implied” volatility of the market and is the basis for the well-known Vix, or volatility index. Speculators who believe markets will stay calm can sell (or “write”) options on volatility, earning premium income. The more sellers there are, the more the price, or premium, will fall (and the lower the Vix will be). The danger, then, is that a sudden pickup in volatility could result in speculators suffering losses. A linked issue is that investment banks use a measure called “value at risk” to help determine the size of their trading positions; reduced volatility will encourage them to take more risk. Since volatility tends to rise when asset prices are falling, this could be accompanied by much wider financial distress. However, the Vix measures the implied volatility over just a one-month horizon. It is possible to calculate implied volatility over a two-year period, creating a slope akin to the yield curve, which measures interest rates for different lending durations. 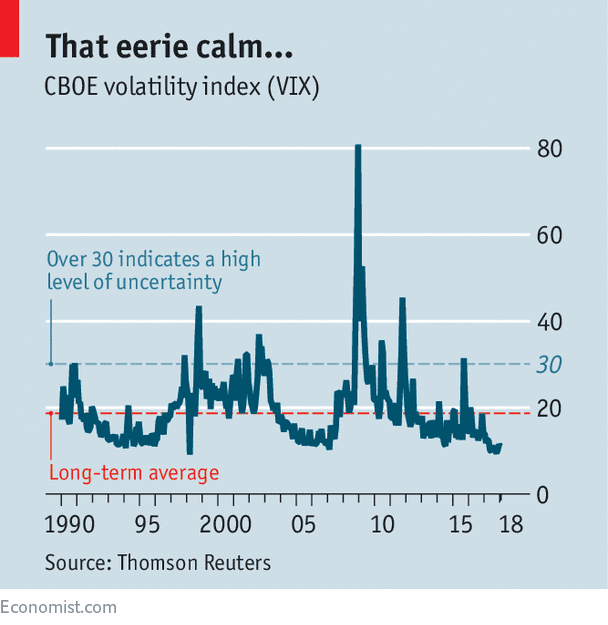 Back in 2006-07 this volatility curve was very flat, suggesting that investors thought that conditions would continue to be rosy. That may explain why so many were caught out by the problems in the subprime mortgage market. This time, the Fed says the volatility curve is steeply upward-sloping (since 1996 the slope has been steeper only 15% of the time). 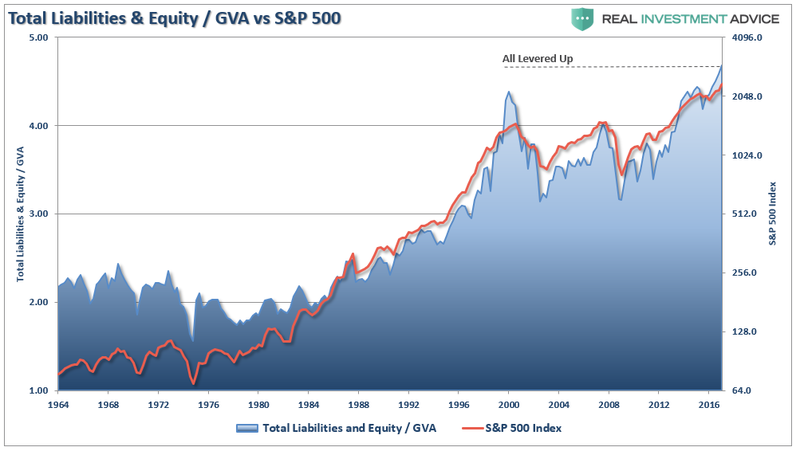 This suggests that investors are not complacent at all, and think that volatility may soon return. Investors seem to think the Vix may be as high as 20% (compared with around 11% today) within the next one or two years. The obvious catalyst for such a change is monetary policy. The Fed is pushing up interest rates and slowly unwinding QE; the European Central Bank is scaling back its bond-buying. So far, this process has occurred without any great alarms. But there may yet be a “tipping point”, when higher rates cause problems for investors and borrowers. In any cycle there is always some institution that has taken a lot more risk than the rest. If a storm comes this year, the world will discover who has gone out without a coat or umbrela. Mere days ago, in what feels like a different era now, the biggest thing that people in control of money appeared to fear was complacency. Stock markets in the United States were surging, enthralled by the regulation-slashing, tax-shrinking predilections of President Trump. Every major economy in the world was expanding. The worst that could happen, the money masters averred, was that investors would be lulled into reckless investments, taking on too much risk in the belief that the dangers of the marketplace had been tamed. As it turns out, the dangers were already at work. A decade-long era of easy access to money engineered by central banks in Asia, Europe and the United States was ending, opening a new chapter in which corporations would have to pay more to borrow and ordinary people would have to pay more to finance homes, cars and other purchases. To digest the wild swings in stocks and bonds from New York to London to Tokyo is to absorb this uncomfortable realization taking hold. No degree in finance was required to divine the lesson of the moment: Markets go down as well as up, a reality often drowned out by the euphoric celebrations to greet one record or another being shattered. While trading in the United States was clearly the initial source of alarm, the concerns spread to everywhere that money changes hands. The American economy had swapped the frivolity of a stock market party for the grim trappings of a bedside vigil. The result was gloom and anxiety in every reach of the financial sphere. The fear that seized the United States was the spawn of good times. As the feeling sank in that stock trading was governed by a surplus of exuberance, the odds increased that the Federal Reserve would dampen the festivities by lifting interest rates faster than policymakers had previously telegraphed. Not for nothing, central banks are seen by investors as crucial yet fun-averse grown-ups charged with solemnly watching for trouble. When crises emerge, they make money available to spur commerce while keeping terror at bay. The global economic expansion underway now is in large part a product of the Fed’s swiftly unleashing an overwhelming surge of credit after the start of the financial crisis in 2008, combined with the slower yet, eventually, effective torrent of cash delivered by the European Central Bank. But when the party gets raging — when economies accelerate and stock prices ascend to levels out of whack with fundamentals — central bankers play killjoy, lifting interest rates to snuff out attendant dangers. Higher rates diminish speculation that can end badly by making credit more expensive. They slow economic growth while making stocks less appealing, because corporations must pay more to keep up with their debts. Investors can make more just by keeping their holdings in cash or bonds, rather than by accepting the higher risk of stocks. The bitter irony of the current swoon is that it was triggered by the emergence of something the world has been awaiting for years: higher wages for workers. Even as unemployment rates have lowered drastically in Britain, Japan and the United States, companies have continued to find new ways to make more products and sell more services without paying more to their employees. This has been a major source of unhappiness among working people, and a subject of consternation among policymakers. Then, last Friday, the latest monthly snapshot of the American labor market revealed that wages had climbed 2.9 percent in January compared with a year earlier. The tight job market was forcing employers to pay more. This appeared to presage a strengthening of American consumer power. If more working people take home more money, they will presumably be more inclined to buy houses and cars, generating jobs in construction and at auto plants from Michigan to South Carolina. They will fill restaurants, necessitating more truck drivers to ferry the food, and more mechanics to keep the trucks running. This same so-called virtuous cycle appeared to be amplifying global growth. More cars made in the United States would require more brake linings made in Mexico and more circuitry forged in China, using copper mined in Chile. More construction would require equipment from Germany and Japan, and more iron ore from Brazil to make steel. This interconnectivity has been central to the anticipation that a strengthening economy in the United States would lift fortunes around the world. But the increase in wages for American workers meant something else. It was a flashing warning to investors about potential inflation, or rising prices, which have crippled many economies. The Fed, always vigilant, wields a standard tool for snuffing out inflation if necessary: higher interest rates. This is how a positive jobs report, presumably a sign of a strengthening American economy, wound up as the impetus for the dumping of stocks from Taipei to Toronto. It enhanced the likelihood that the Fed would raise rates faster. It prompted investors to wonder how long the European Central Bank could maintain its own ultralow rates. In the past year, Europe has shaken off perpetual worries of a grinding decline to emerge as one of the faster-growing major economies on earth. Inflation remains weak in Europe, undergirding expectations that the central bank will be slow to take back its free money. But if the Fed were to lift rates faster, that could prompt Europe and perhaps even Japan to follow suit. Otherwise, the United States would be in a position to capture an outsize share of global investment, as rates presumably rise on American government bonds. All of this is playing out amid a transition in central bank leadership. At the Fed, Janet L. Yellen, the economist who was the chairwoman of the Board of Governors, on Monday completed her term and handed power to her successor, Jerome H. Powell. Mr. Powell is widely expected to continue Ms. Yellen’s cautious march toward higher interest rates. Still, as a newcomer taking the tiller in the midst of extraordinary volatility, he is a variable. Mario Draghi, the Italian who heads the European Central Bank, is scheduled to complete his eight-year term late next year. At the Bank of Japan, Haruhiko Kuroda’s term as governor expires in April, and there is uncertainty over whether he will be reappointed. Some economists think that the dour talk is overblown and that the stock markets are running on emotion untethered from economic reality, a narrative that gained force as markets in New York snapped back from the depths on Tuesday. The fundamentals of the United States expansion remain intact. Rising wages should indeed give people money to spend without resorting to some newfangled credit bubble that ends tragically. Whatever the interest rates, central banks retain trillions of dollars on their balance sheets earmarked for buying up financial assets, making credit available. 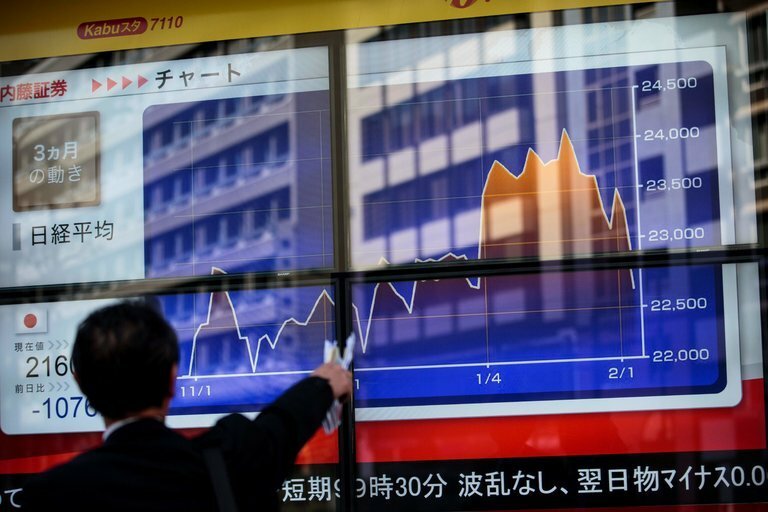 And the return to higher interest rates is inevitable, a healthy turn for a world economy that can finally close the books on the global financial crisis that began a decade ago. The global economic expansion has occasioned hopeful talk that the world now has multiple engines of growth, inoculating it against trouble in any single region. But the events of recent days have challenged that notion, given that a sudden deterioration of stock prices on Wall Street quickly burst into a global rout. Sentiments are clearly a viral phenomenon. Yet the distress in global markets also underscores the fact that real economic fortunes are fused. If General Electric, Ford and other multinational companies see their share prices brought down as borrowing costs climb, they could limit plans for expansion. The trend would be felt in diminished orders for computer chips made in Taiwan, flat-panel displays forged in South Korea and auto parts built in the Czech Republic. It could cool demand for raw materials harvested from Argentina to India to South Africa. Since the beginning of the year, the acceleration in the markets has continued unabated. As I showed yesterday, the acceleration in the S&P 500 has now gone parabolic. Of course, market melt-ups are symbolic of the final phases of "capitulation" as investors who feel like they "missed the boat," finally jump back on board. Such can be confirmed by the numerous emails from individuals asking me is "now the time to get back in?" As shown in the chart below, such is the epitome of the "buy high, sell low" syndrome. 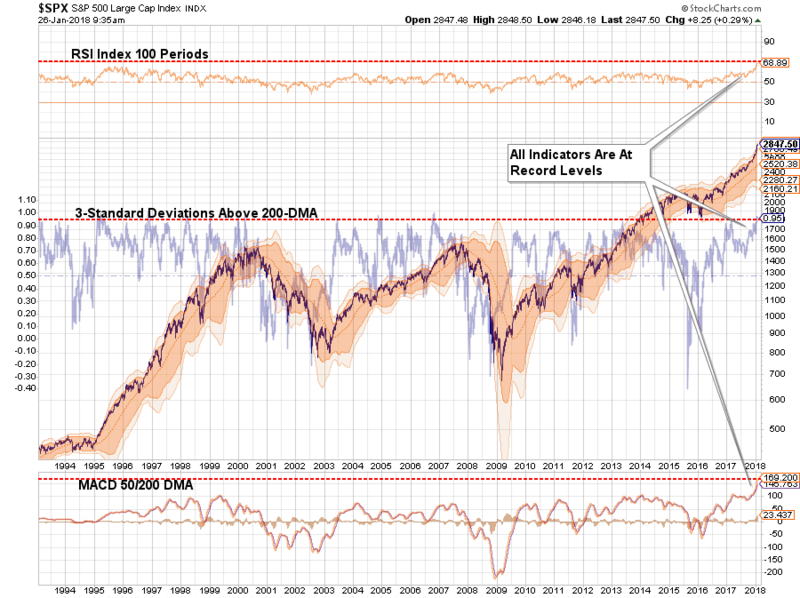 Never before in recent history has the market been this overbought and extended from longer-term averages which suggests that a correction that reduces such conditions is highly likely in the near-term. 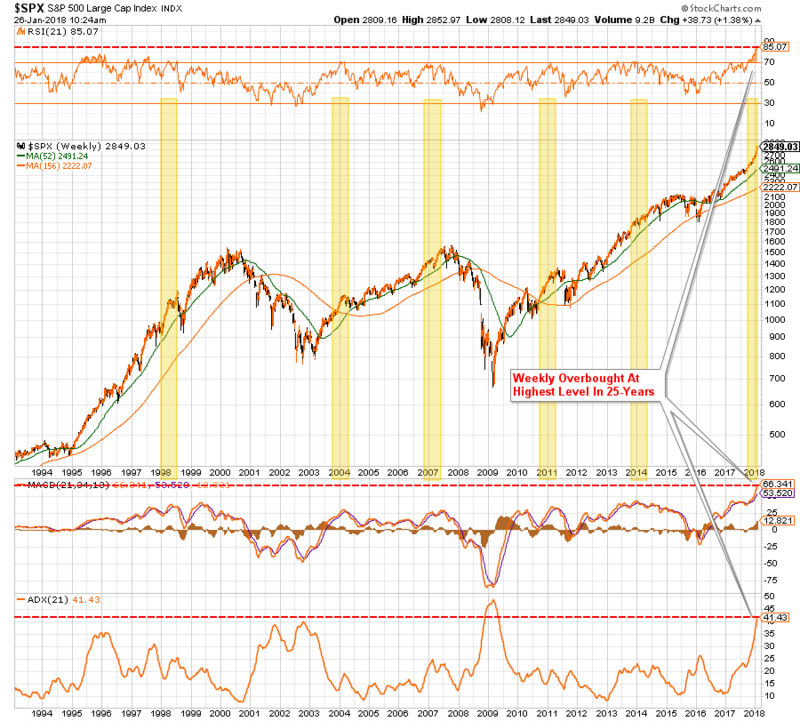 This doesn't necessarily mean a "full blown" market crash, but even a correction back to the 200-dma, which is certainly within the scope of normal corrective actions, would currently entail a drawdown of almost -13%. But let's step back to a weekly chart and look at previous periods where historically high overbought conditions have existed previously. On a weekly basis, a correction back to the 52-week moving average would require a bit more than a -14% decline while a correction back to the long-term trending average would be roughly -28% from current levels. As I have said before, given we are now in the longest stretch in market history without even a 3% correction, 13% to 14% is going to "feel" worse than it is, and 28% will be equivalent to a full-fledged crash. But just to keep that in perspective, a 28% decline from current levels only sets investors back to 2015. But, given that most investors are driven largely by emotion, those that have jumped in just recently, will be looking to "bail out" with that kind of a drop. "For now, it is hoped that historically high levels of stock valuations will be reduced by an explosion in underlying earnings growth due to the impact of tax reform. It is what always happens. Yes, currently, everything is absolutely, positively, optimistic. Economic growth has picked up over the last couple of quarters due to an unprecedented level of natural disasters, oil prices have risen boosting production and corporate earnings, and employment is at historically high levels if you don't count those out of the labor force. The positive backdrop for stocks could not be currently better." Such is certainly the case for now. Meanwhile, in Davos, the confab of billionaires, world leaders, and the media have gathered for the annual confab in which the fate of the world is determined. We were fortunate enough to obtain a clip from one of the speeches. However, not all the views from Davos were of global tranquility and peace. Barclays CEO Jes Staley warned that financial markets remind him somewhat of what was seen before the 2008 crash. "This feels a little bit like 2006. There are lots of reasons to be optimistic. Global economic growth across the board is doing great at roughly 4%, unemployment rates in the U.K. and the U.S. are at almost record lows. All that is great. But all that comes amid 'incredibly accommodating' monetary policy, with interest rates that almost assume we're still in recession. If interest rates move too quickly and volatility whips around, things could get 'interesting' for markets over the next two years. It's 'concerning' that people are selling short volatility even as it's historically low, asset values are at all-time highs, and every major industry around the world last year grew by more than 20%." "Complacency in the markets is a key risk: Valuations are at unprecedented levels. The probability that we'll encounter an unforeseen crisis on the next part of our journey is high." "Everyone feels, despite the exuberance in the market, that we need to dial down on the risk." "The markets are being driven by a synchronized economic recovery in the U.S., Asia and Europe. Markets are focused on the business cycle rather than politics. Most asset markets are therefore ignoring politics-with the exception of the foreign-exchange market. One possible reason for the lack of market focus on politics may be the growth of automated trading as robots are much less interested in politics than humans." "The biggest concern I have is that most people think there's no problem of a likely recession this year or early next year. Generally, when people are happy and confident, something wrong happens." "If interest rates go up even modestly, halfway to their normal level, you will see a collapse in the stock market. I don't know how everything from art and bitcoin to stock prices will react as interest rates go up." Of course, with interest rates around the globe at historic lows, companies have binged on cheap borrowing, easy credit terms and "sellers' market" as investors chase yield. You will notice that each major market peak in history was accompanied by high leverage ratios. The biggest risk, as noted last week, is a significant rise in interest rates the "pricks" the debt bubble. Let me reiterate that while I am currently monitoring the risk in the market, such DOES NOT mean I am "bearish" and sitting in cash on the sidelines. However, given the current extensions, we have rebalanced portfolios a little bit to bring in some of the gains in larger equity-based holdings and added some hedges to reduce volatility risk. I want to reprint something I have posted previously, but given the current environment, felt it was worth repeating. Our job as investors is actually quite simple, but investors consistently repeat the same mistakes. From exuberance to fear, buying high to selling low, chasing returns, and always believing this time is different, only to once again be reminded it's not. The current environment of daily price gains certainly makes it easy to rationalize why prices can only go higher, why this time is different than the last, and why only the "bullish views" matter. If the markets rise, terrific. We all make money, and we are the better for it. However, that is not our job. Our job is to analyze, understand, measure, and prepare for what will negatively impact the value of our invested capital. If we are to accumulate capital over the time span that we have available, from today until we reach retirement, the most important thing we can do to ensure our success is not suffering a large loss of it. Expectations based on realistic objectives. (The market does not compound at 8%, 6% or 4%). You can replace lost capital - but you can't replace lost time. Time is a precious commodity that you cannot afford to waste. Portfolios are time-frame specific. If you have a five years to retirement but build a portfolio with a 20-year time horizon (taking on more risk), the results will likely be disastrous. With forward returns likely to be lower and more volatile than what was witnessed over the past decade, the need for a more conservative approach is rising. Controlling risk, reducing emotional investment mistakes and limiting the destruction of investment capital will likely be the real formula for investment success in the decade ahead. Emotions have no place in investing. You are generally better off doing the opposite of what you "feel" you should be doing. The ONLY investments that you can "buy and hold" are those that provide an income stream with a return of principal function. Fundamentals and Economics drive long-term investment decisions - "Greed and Fear" drive short-term trading. Knowing what type of investor you are determines the basis of your strategy. "Market timing" is impossible - Managing exposure to risk is both logical and posible. There is no value in daily media commentary - Turn off the television and save yourself the mental capital. Investing is no different than gambling - Both are "guesses" about future outcomes based on probabilities. The winner is the one who knows when to "fold" and when to go "all in". As I have stated before, as a portfolio manager, I am neither bullish nor bearish. I simply view the world through the lens of statistics and probabilities. My job is to manage the inherent risk to investment capital. If I protect the investment capital in the short term - the long-term capital appreciation will take of itself. Right now that job is easy. It just won't always be the case. This is just getting a bit TOO extreme. Take a look at the sectors below. 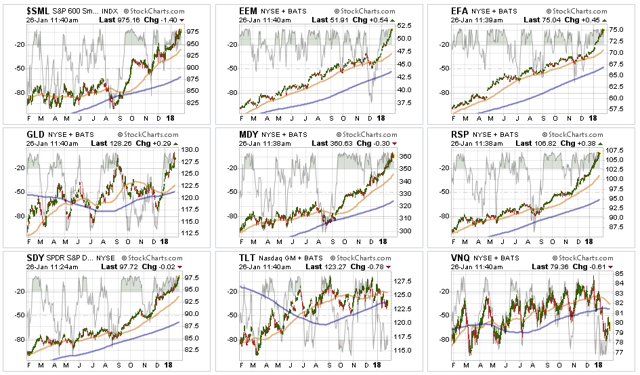 Every sector is pushing 2- and 3-standard deviations of longer-term moving averages. 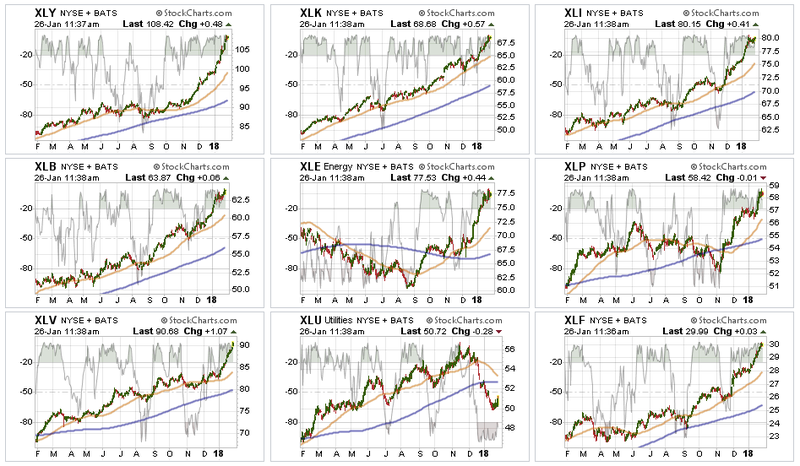 Every Sector Except Utilities remain in full-fledged party mode again this last week with Staples catching up to the party as the chase higher continues. The massive overbought conditions in every sector, again except Utilities, needs to be reduced before a better entry opportunity will present itself. We are still long our positions but continue to hedge risk and rebalance opportunistically. 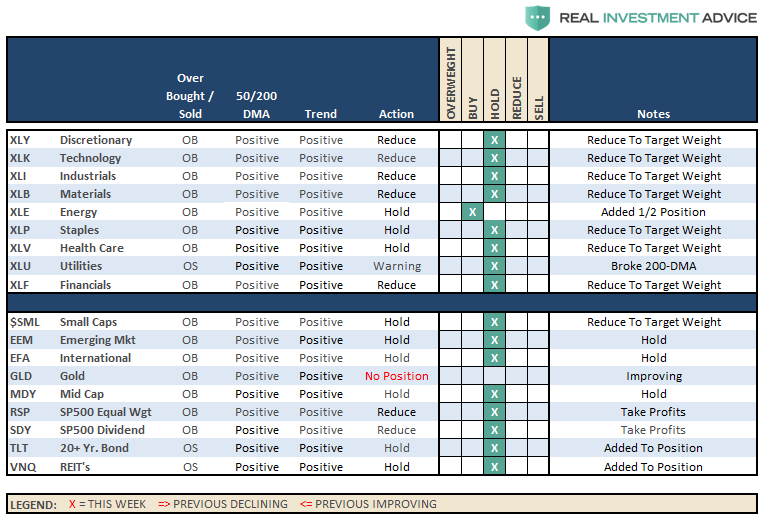 Energy - As I noted in December, the positive backdrop developed in the energy sector on a technical basis. 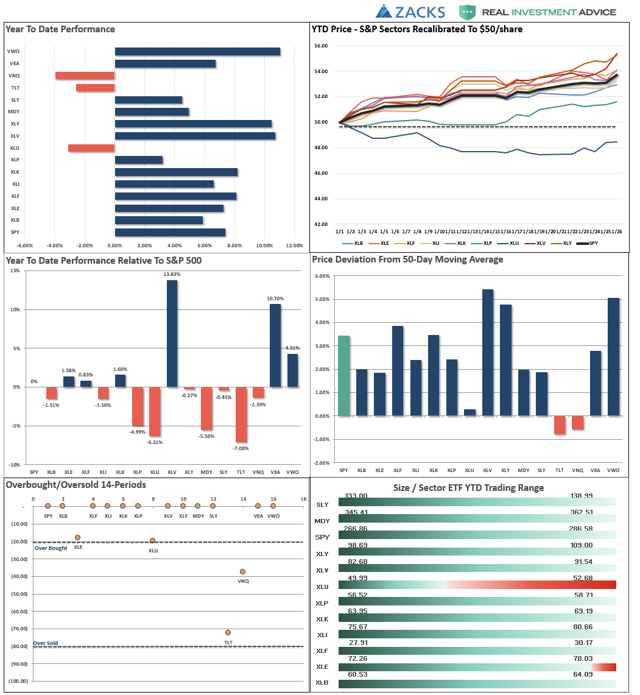 We added one-half of a tactical trading position to portfolios last month which has paid off well. However, that trade has gotten way over-extended so look to take profits on any weakness. We are moving up our stop-loss levels as well. Utilities - We remain long the sector for now and added some weight to the sector as a hedge against a risk-off rotation. With the sector very oversold, we did begin to see that start of an upswing this last week. We continue to look for a risk-off rotation soon to see a further pick-up in the sector. Small and Mid-Cap Index trends are positive, which keeps allocations in the markets, but the extreme overbought conditions make adding exposure here riskier. Look for weakness to take profits and rebalance weights in portfolios. Emerging Markets and International Stocks - As noted below, we added some international exposure on the breakout following the recent pullback. The markets are extremely overbought on every front, so, as with virtually every other position, rebalancing portfolio weights and reducing some risk is prudent. Gold - We are now fully on the lookout to add gold into portfolios on any pullback that somewhat reduces the current overbought conditions without violating important support levels. A rally in the dollar from currently extremely oversold levels will likely provide that opportunity. S&P Equal Weight & Dividend Stocks - As noted previously, both of these positions have simply gone parabolic as money is chasing yield currently. We have moved up stops and are looking to take profits and rebalance accordingly. Bonds and REITs - We remain long these sectors and did add to them recently on weakness as a hedge against a "risk off" rotation. Our conviction on these positions continues to rise, but we are still honoring our longer-term stop-loss levels. Also, as noted four weeks ago, hedges were added to our portfolios. Given the parabolic rise in the markets, which has created massive extensions in price, we continue to maintain those hedges for now. We will add to them once a correction begins to ensue. As far as portfolios go, we continue to maintain our current positions. As noted over the last few weeks, our most recent additions were Energy in mid-December and the Russell 2000 and Japan on recent breakouts three weeks ago. While our hedges are under pressure currently, they are small relative to the long-side of our portfolio. As always, we remain fully invested but are becoming highly concerned about the underlying risk. Our main goal remains capital preservation which is why we are de-risking portfolios where and when we can. There are four steps to allocation changes based on 25% reduction increments. As noted in the chart above, a 100% allocation level is equal to 60% stocks. I never advocate being 100% out of the market as it is far too difficult to reverse course when the market changes from a negative to a positive trend. Emotions keep us from taking the correct action. Over the last several weeks, I have noted how the current advance just keeps getting "nuttier." 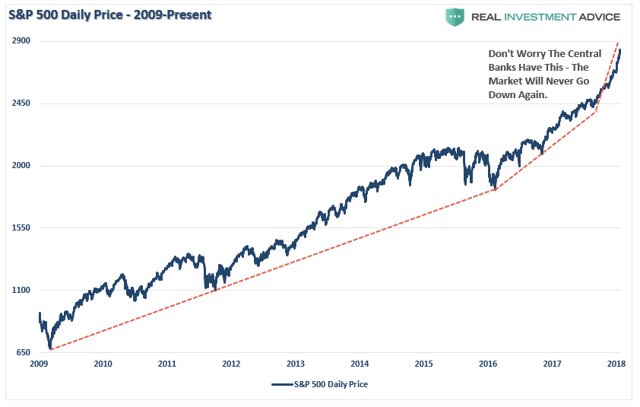 The acceleration of the advance is not only unsustainable, but it is also dangerous, as eventually it will lead to a very sharp reversion that few investors are ready for. But I know. It hasn't happened yet. However, just because it hasn't happened yet does not mean it won't. As with everything in life, "timing" is everything. While portfolio allocations remain at target levels, for now, the time for complacency is now gone. I have added a couple of notations to the 401(k) plan manager graph above. The markets have now MASSIVELY pierced the top of the long-term bullish trend channel, which only happens either at the peaks or troughs of a market trend. 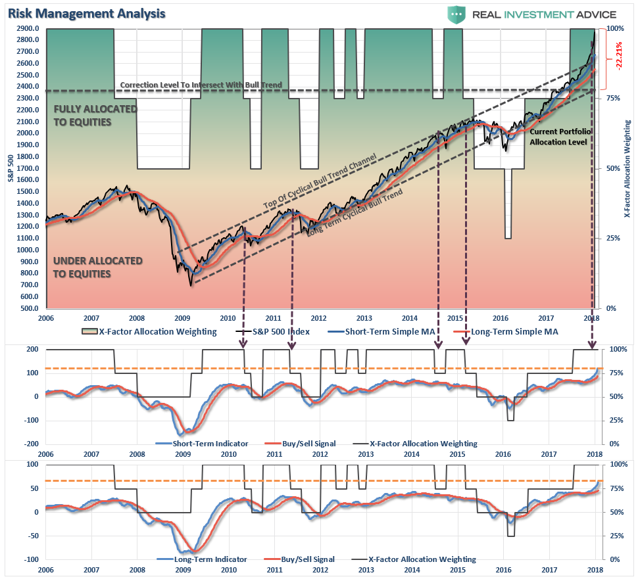 Secondly, as noted by the arrows, with the markets extremely overbought and extended, the risk outweighs reward at this juncture. 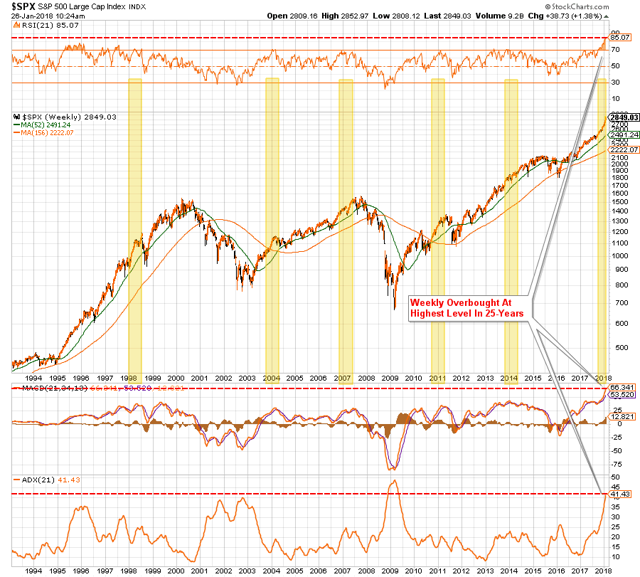 "Importantly, note the orange horizontal lines I have added in the two bottom buy/sell signal indicators. The market has never been this overbought since I began tracking our model in 2006. (Just for the record, it hasn't been this overbought since the turn of the century when I began running this model in the newsletter.)" Given the inability to hedge 401(k) plans, I continue to recommended rebalancing risks in portfolios by trimming overweight equity exposure and adding to fixed income exposure. 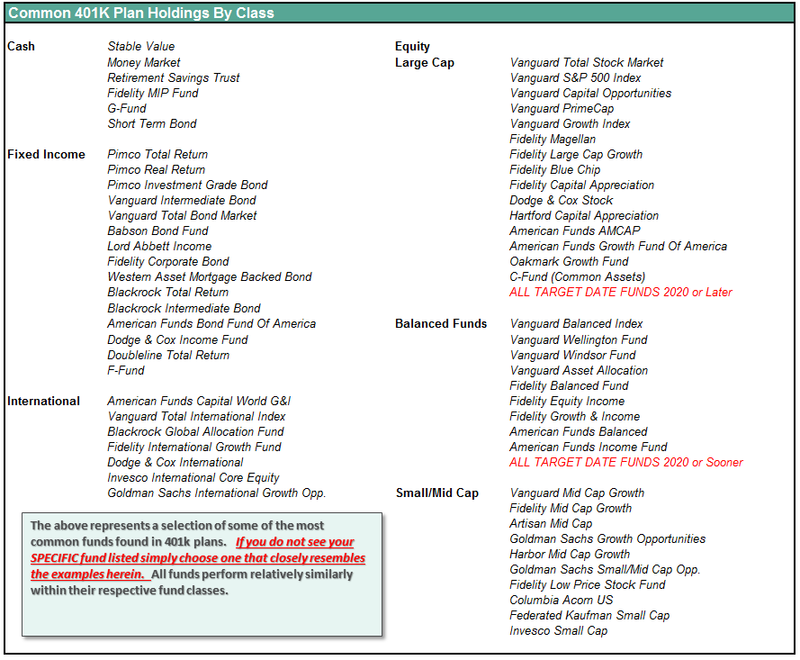 The 401(k) plan allocation plan below follows the K.I.S.S. principle. By keeping the allocation extremely simplified, it allows for better control of the allocation and a closer tracking to the benchmark objective over time. (If you want to make it more complicated you can, however, statistics show that simply adding more funds does not increase performance to any great degree).